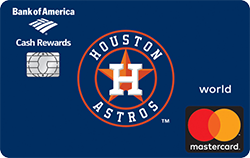 Houston Astros Mastercard gives new cardholders 0% financing on purchases or balance transfers(3% fee) for the first 12 billing cycles. Show your support for the Houston Astros this season with the only credit card that features the official Astros logo on it. Be rewarded in return for your loyalty by applying here and select the Houston Astros as your team to get the ball rolling.